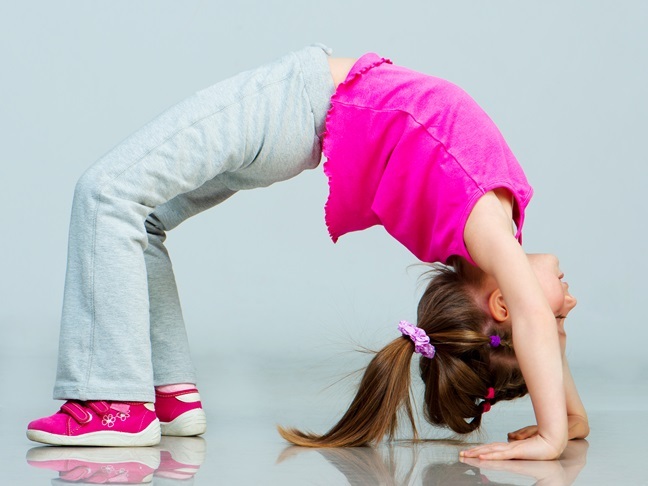 Gymnastics Class is Intense: Is My Daughter the Only One Who Just Wants to Have Fun? Sitting through Elizabeth's gymnastics class is a new experience for me. Up until recently, her class time fell during my work day, but with her latest advancement, I've been able to join the other parents and grandparents in the white plastic chairs lining the blue carpeted floor of the gymnastics studio. The first evening, I sat down on the rigid seats and deposited my purse in the empty seat to my right. To my left, a kind looking older woman watched the various classes flip by. She glanced at me, made eye contact and smiled. "Which one is your daughter?" she asked in a friendly voice. "The one in the hot pink leotard getting ready to do her somersaults," I replied, pointed to where Elizabeth tumbled down the trampoline. "Oh! She's a Junior! So's my granddaughter." "Which one is she?" I asked politely. The woman pointed at an adorable little girl with a long blond braid hanging down her back. "She's cute." "Yes," the woman said with grandmotherly pride. "My other grand daughter is club level." Her eyebrows rose. "Over there." She gestured to an area where preteen girls flipped and balanced on the beams. "Yes," she sighed. "Though we're a little happy she didn't make it to finals. Missed it by two points but if she had, we'd have another month." I nodded as if I knew what she was talking about. "She's here two hours a night, three nights a week." She nodded. "She actually practices every night. We put a trampoline in the backyard and converted the garage into a small gym so she can spend as many hours as she needs to get competition ready. It's why her little sister is so good. We've had her training with big sister since she could walk," she chuckled. I joined in awkwardly wondering if I was supposed to say something. "How many hours a week does your little one practice?" "Elizabeth?" The woman nodded. "Well, I mean, she just started in August and she's only four." "My granddaughter is four too." Her eyes sharpened. "What month is your daughter's birthday?" "August," I said, confused as to where the conversation was going. "Oh," she said with a smile, "Katelyn is the youngest in the class. Her birthday is in September." "She's doing very well, your daughter." "She looks like she's having a good time." "You know, everything they teach in this class prepares them for competition." "Oh. Well, she likes to tumble and she loves the hopping." "Don't worry," she said with a smile, "you'll catch the bug soon!" I murmured something that could have been agreement and stared back out at the little girls with their braids and ponytails as they bounced and flipped, pranced and swung. Elizabeth waved from her position on top of a pile of mats while she pointed her toes. I waved back and thought to myself, she's four. Have you caught the gymnastics or dance bug? My Kids Love My Nanny More Than They Love MeHey Joan Rivers, There’s No Such Thing As An Ugly Baby!